From the creators of the Positive Groove & more family oriented dance crazes, it's the David Nance Group, performing live this summer, baby! Omaha Avant-Bar-Rocker David Nance will be performing live in Australia with the David Nance Group, this January/February 2019, courtesy of Tenth Court. The Australian edition of the David Nance Group features Anna Nance on the noise box, as well as Matthew Ford & Innez Tulloch of Thigh Master filling out the rhythmic entities. 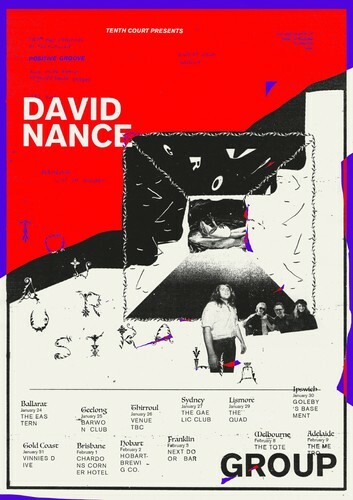 Hot off the back of an endless US tour and squished between a second trip to Euro, David Nance Group are due to burn out somewhere along the Bruce Highway. David Nance is nothing if not prolific, having released 4 full-length albums for labels Trouble in Mind, Grapefruit and Ba Da Bing, a 7-inch, numerous cassettes, CDRs and unlicensed "cover albums" of artists like Lou Reed, The Beatles, Rolling Stones and Doug Sahm, in the short space of the past 6 years. Visceral, unhinged, poetic and idiotic, Nance’s work is built upon contradiction. Semi-master of the Midwest ‘raga’ and full-blown expert of the avant-bar...rock. His sound resembles an active volcano, allowing necessary eruptions to either fossilize time or destroy the whole foundation of whatever is happening at that moment. Nance is entertainment in its purest sense. Thank you for your attendance.